Tiger Woods plays a tee shot from the 13th tee during the first round of the Dell Technologies Championship at TPC Boston on August 31 enroute to shooting a 1-over par 72 with a boisterous and supportive gallery following every swing. 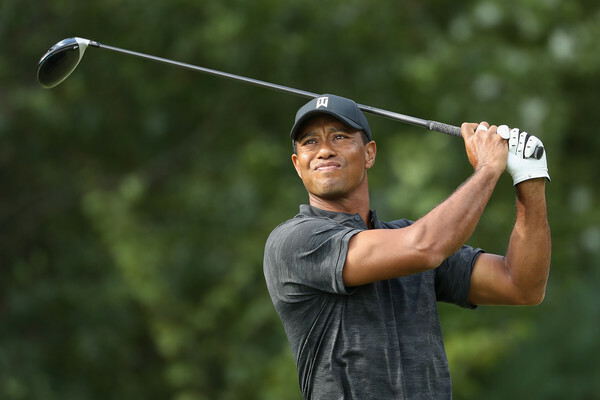 NORTON, MA – New England sports fans have waited five years to see Tiger Woods tee it up at their local PGA Tour stop, so it was no surprise when they showed up big-time to support him. So tailing Tiger during the first round at the Dell Technologies Championship was a walk down memory lane as the loudest Tiger roars this side of Augusta were again in the air at TPC Boston. The always passionate local sports fans brought their A-game for the first round as they trailed the legend, often six-deep surrounding the greens and tee boxes while also lining his walkways from green to tee shouting encouragement. 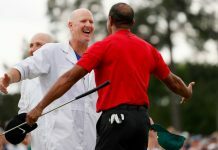 A big reason for this strong connection is that for years this tournament, formerly known as the Deutsche Bank Championship, was staged in conjunction with the Tiger Woods Foundation, so the region could pretty much count on his participation here every year. Staged here since 2003 on Labor Day weekend and featuring the only Friday-Monday format on the Tour, the event has firmly woven itself into the fabric of New England sports, marking the end of summer as surely as the 100,000 students moving into their various colleges every first weekend of September. But that will change next year as the massive changes adopted for next year’s Tour bypasses Boston, which for over a decade has been a FedEx Cup playoff event, but it may return here in 2020. So the combination of no 2019 event here combined with Tiger’s absence in recent years turned yesterday into a time to be treasured, both to welcome him back with open arms while never taking for granted that tailing Tiger in a tournament is not a given, but an event like no other.